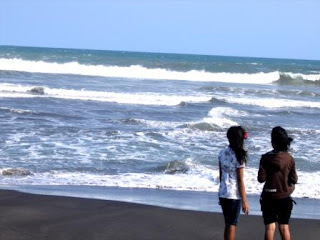 Parangtritis is a tourist place of the Indian Ocean coastal beaches are located approximately 25 kilometers south of Yogyakarta city. Parangtritis an object to a well-known tourism in Yogyakarta in addition to other objects such as Samas beach, Baron, Kukup Krakal and Glagah Beach. 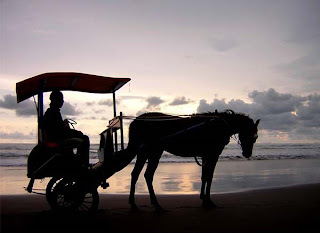 Parangtritis has unique scenery that is not in the other tourist attractions besides the big waves are also the mountain - the frequency dunes around the coast, these dunes called Gumuk. This tourism object is managed by the local government of Bantul pretty well, ranging from lodging facilities as well as souvenir markets offering typical South. In addition there is bathhouse called wedang machete in the bath water is said to cure various diseases including skin diseases, water from the bath containing sulfur from the mountian at these locations. Another location is the beach kusumo machetes on the beach where there is supposedly for a meeting place between the king with a queen jogjakarta southern ocean. On certain days (usually months suro) here is offering offerings (Labuhan) for the Queen of the South Sea or in the Java language called Nyai Rara Kidul. Locals believe that a person is forbidden to use green colored clothes when they're on this coast. 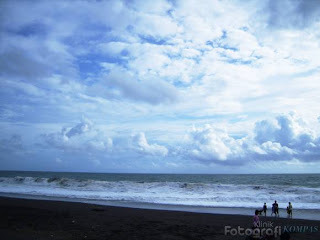 Parangtritis beach into a major tourist visits, especially in the Javanese New Year's Eve (1 sacred / Suro). 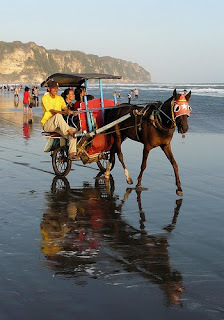 In Parangtritis there is also horse-drawn carriage or a horse that can be rented for up the coast from east to west.